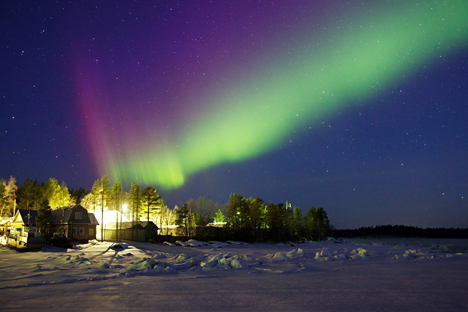 According to astronomers, the year 2015 will see a rise in aurora borealis in northern Russia. Scientists link it to a cyclical pattern of increased solar activity. In 2014, parts of Russia located beyond the Arctic Circle witnessed aurora borealis more frequently than usual. Astronomers say this trend will continue in 2015 due to a rise in solar activity that occurs every 11 years. However, this beautiful natural phenomenon is not as innocuous as it may seem and can affect human physical wellbeing and disrupt radio communication. In late December the aurora borealis could be observed up to five times a week in Murmansk Region, the northernmost part of western Russia. Photographers decamped to the countryside with their equipment with the hope of capturing stunning pictures. Astronomers, both professional and amateur, spent hours glued to their telescopes watching the stars exhibit their unusual behavior. According to scientists, the Sun has recently reached yet another peak in its activity. The previous one was recorded in 2000. After its activity reached its zenith, a period of decreased action followed and the Sun's magnetic field began to restructure. During that period, astronomers recorded a large number of flares on its surface. "In the second half of December we recorded powerful solar flares of class M,” says Viktor Troshenkov, head of the Murmansk Region Astronomical Society. “This may not mean much to a lay person, but to give you a basis for comparison, the bomb that was dropped on Hiroshima was equivalent to some 20 kilotons of TNT. Imagine that millions of similar bombs explode at the same time. That was the power of those solar flares." To be precise, the figures involved are billions and trillions. Yet, as far as the Sun is concerned, class M (or moderate) flares are not the most powerful ones. In late December astronomers recorded an outburst of energy 10 times stronger, of class X. It caused a disruption to high-frequency radio communications in Australia. "When magnetic lines on the surface of the Sun cross, something similar to a short-circuit happens,” explains Stanislav Korotky, head of research at the Ka-Dar observatory. “It is like when you cross a plus and a minus wire, you will see a spark. Similar sparks, but far more powerful, happen on the surface of the Sun." Flares increase the solar wind flow, or the flow of charged particles emitted by the Sun. If it is directed towards our planet, the atmosphere of the Earth reacts to it with geomagnetic storms and aurora borealis. In 2015 flares will be seen often in all parts of Russia that are situated beyond the Arctic Circle: Murmansk Region, Chukotka and Taymyr. The Sun's increased activity may cause not only disruptions in radio communications, but also present a danger for satellites and astronauts. Additionally, their effects are likely to be felt by people over 60 as they are more easily affected by changes in the atmosphere as well as those that have suffered head injuries. However, an average healthy person is unlikely to feel any repercussions of these cosmic storms.